ESPN2’s Cari Champion is heading to the big leagues. The co-host of the ESPN2’s “First Take” for two and a half years has been named the newest anchor of ESPN’s “SportsCenter,” TheWrap has learned. She is expected to work on morning segments of the broadcast beginning in mid-July, particularly a series of upcoming “interactions” about sports and entertainment with members of ABC’s “Good Morning America.” ABC and ESPN are both divisions of Disney. 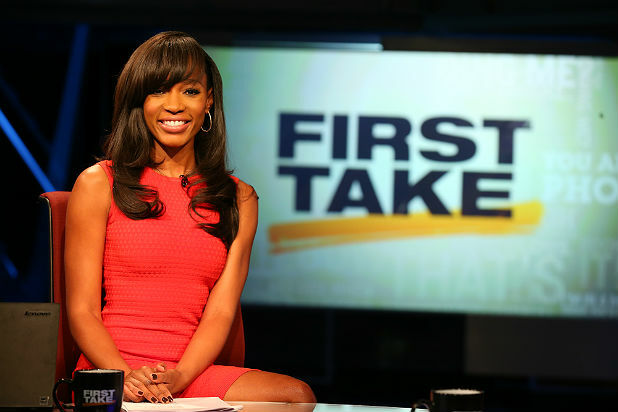 While working at ESPN2’s “First Take” desk, she found herself moderating heated debates between outspoken co-hosts Stephen A. Smith and Skip Bayless. “I realized that it was going to be a tough gig as I had the biggest, strongest personalities in the building,” she said. ESPN brass had high praise for Champion. Champion was the subject of an obscene Twitter rant by comedian and Howard Stern cohort Artie Lange last year, which the network slammed as “reprehensible.” While she didn’t publicly address the outrage, the disgusting tweets prompted ESPN to ban Lange from the network. Prior to joining ESPN in October 2012, Champion was an anchor and court-side reporter at the Tennis Channel. She also served as an entertainment/lifestyle reporter for “The Insider,” Hollywood 411 and Starz Entertainment.